I've decided that right now is the best time to take a little (figurative) whisky voyage away from the United Kingdom, United States, Ireland, Japan, and Canada and towards a few of the countries newer to the whisky world. Australia (specifically Tasmania) actually has quite a buzzing, burgeoning whisky industry. Companies like Lark and Sullivan's Cove lead the way in size and media coverage. Meanwhile Bakery Hill, Belgrove, Hellyers Road, Limeburners, Nant, Old Hobart, and Timboon are growing, cranking out more whisky every year. Though the distilleries follow most of the classic Scotch/Irish distilling methods, they're using local barley and water. And they've been experimenting with the maturation process. For instance, Bill Lark has been aging much of his whisky in former port pipes split up into smaller barrels. Also, the local peat is made up of different vegetation than that of Scottish peat, so when any of these companies smoke-dry their malt, the phenolics are unique. The one on the right is the Sullivan's Cove. Maybe we'll explore the bottle on the left this summer? Thanks to two of Kristen's coworkers (Chris for purchasing and Connor for couriering), I have a bottle of Sullivan's Cove Double Cask. 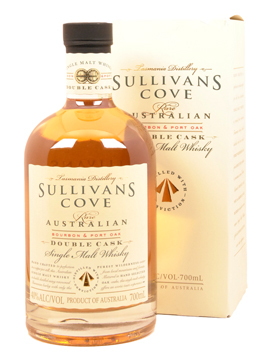 As mentioned above, Sullivan's Cove is one of the major players in the Australian whisky industry. And, as of very recently, some of their single malts have been showing up at American specialty liquor retailers. AND, for some good P.R., Jim Murray raved about their Single Casks in this year's Whisky Bible. As for the Double Cask, there's some ex-bourbon American white oak cask-matured whisky in here, along with French oak casks that had previously held port. According to their site, they turn it out in small batches: one French oak cask to two American oak casks. It is married together for four months, then is bottled at 40% ABV, non-chillfiltered and uncolored. But how does it taste? Nose - Fresh out of the bottle there's a subtle smoke (somewhere between wood and vegetal), then there's some fudgy chocolate. Lots of fresh bananas. Notes of sugary oak, sweat, varnish, and baked goods bounce around. Palate - Kit Kats! Lots of 'em. Plummy dessert wine spilled onto notebook paper. Some cracked pepper floating in urine (What? Don't act like you haven't drunk your own pee. And someone else's. In college. For $12.) A little bitterness arrives after a while. Finish - Decent length for 40% ABV. Malt and red wine. Very tannic. Floral notes meet vanilla notes. Some bitterness shows up after a while. Nose - Toilets overdue for a cleaning (use your imagination). Glade Plug-In floral scent. Some French oak. Sugary dried fruits and perfume. Palate - Goes quiet, though the texture is pleasantly soft. All caramel and vanilla. I'm almost halfway into this bottle and I'm still having a difficult time figuring it out. There are some notes that don't seem to jive, like a homemade blend that's not quite right (see any of my posts on my own failed blending attempts). It makes me curious about their Bourbon Single Cask, as perhaps that lets the spirit run free? But the Double Cask isn't bad for a starter malt. BUT due to the expense behind relatively small distilleries producing whisky in a country enforcing considerable taxes/tariffs, Australian whisky is very expensive. Lark's whiskies run $150-$250 for 9 to 11 year-olds. This Sullivan's Cove Double Cask is usually $90. Had it been in the $20-$30 range, I would recommend it as an intriguing alternative to the Glens 'Livet, 'Fiddich, and 'Morangie. At $40, I'd say it was borderline. But at $90, Double Cask leaves me without much to say. At that price range it is up against some of the most spectacular spirits ever designed by humans. It can't compete, and I'm not sure it is meant to. Perhaps the Single Casks (priced near $150) can flex their muscle some more. If you buy the Double Cask, then you're supporting a growing whisky industry. But that industry would flourish much more if their government (which has let its wine industry avoid certain excises, thus all the cheap Yellow Tail) gave their spirits industry some tax help so that the whisky companies can lower their prices. And I mean, right now. The whisky industry is in a state of explosive growth, growth that may not last forever. Catching this comet would benefit Australian exports. This allows cinnamon and nutmeg notes to emerge, along with a mouthful of vanilla. It's a refreshing Spring weekend drink. It probably won't stay closed that long. :) Probably late June or early July. It's going to be one of my summer malts. I'll let you know!